This year was hands down the best Halloween I've ever had. 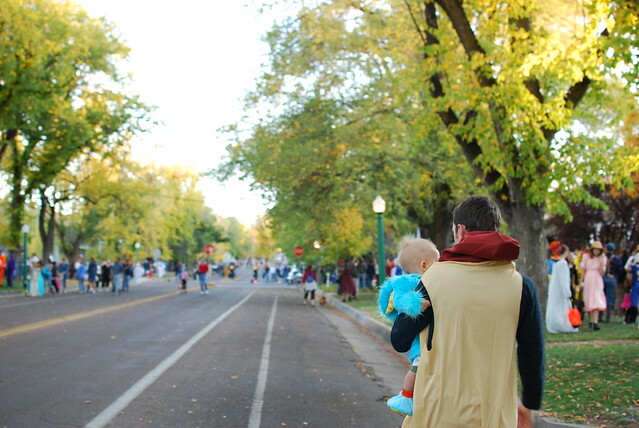 For some reason Hank and I initially decided not to dress up since we thought we'd just quickly take Henry trick or treating...but we decided that was totally lame and threw together some costumes. Hank picked up a hot dog suit on his way home from work, and I had planned on wearing a sailor costume I had from a couple of years ago. Upon finding the costume in our closet though, I realized that that little sailor's ship had sailed a long time ago. I wouldn't say the outfit screamed "tart!" exactly, but it definitely was too short to be appropriate, or to be anything I was interested in wearing now. 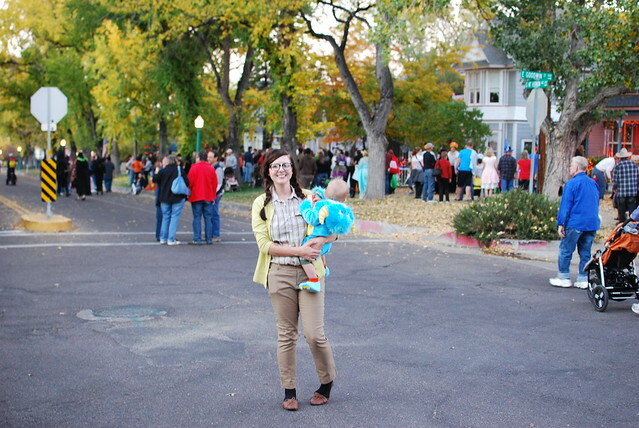 So instead I threw together a "nerd" costume as we walked out the door. Next year though you can bet we're going to put a lot more thought into our outfits and I can't wait! 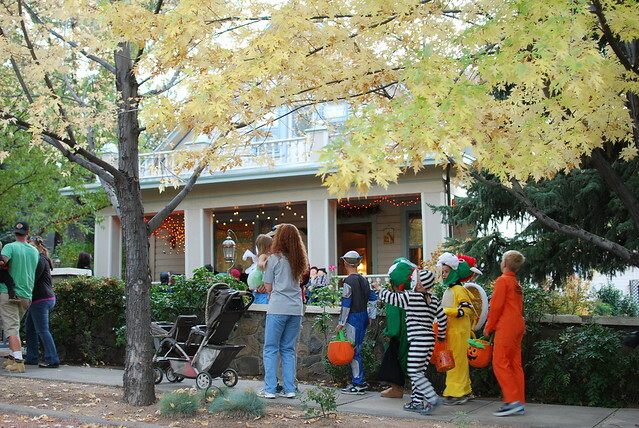 Halloween was so much fun- our little town is all about it, and it was the perfect night for trick-or-treating. The photographs below can tell the story a little better, so enjoy! And I hope all of you had the happiest Halloween. What a cute little town, looks like you guys had a fun time! those houses are adorable? where is that? Oh my gosh, there are so many kids!! I got maybe 40 last night. Henry looks adorable, and so does your new blog design! Holy Cow! 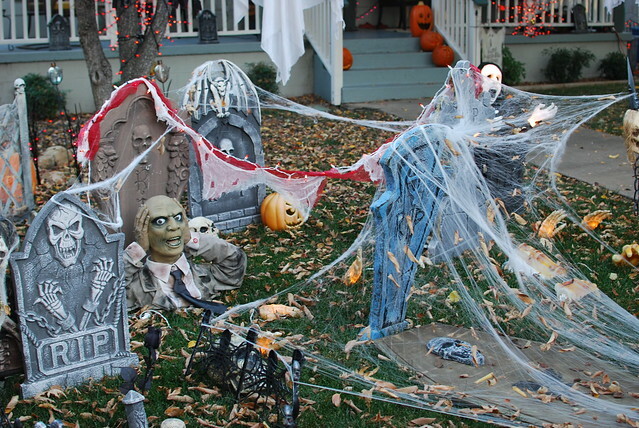 That's the most festive Halloween neighborhood ever!!!!! I LOVEEE that town! And Mr. Henry ROCKED his little costume! that's amazing how active your town is! looks like so much fun! I would love to comment but there's no point since you only comment back to "popular" bloggers. It's so stupid that your blog has become like a second version of high school. You think you're so wonderful and sweet but how are you any different? I see bloggers with three kids, a full-time job and some online classes taking the time to respond to people and then here you are, no job, just sitting around the house all day while your kid naps and can't manage to comment back to anyone with less than a thousand followers. You disgust me and I will not be following your blog anymore as of right now. eeep! i love every bit of this! your little family is the most adorable! Oh my God, Anonymous, that's so mean and inappropriate! I think this blog is wonderful and it's so nice to read it. You can see that she puts in much effort and I can understand that she doesn't take the time to respond to every single comment since she gets so many. 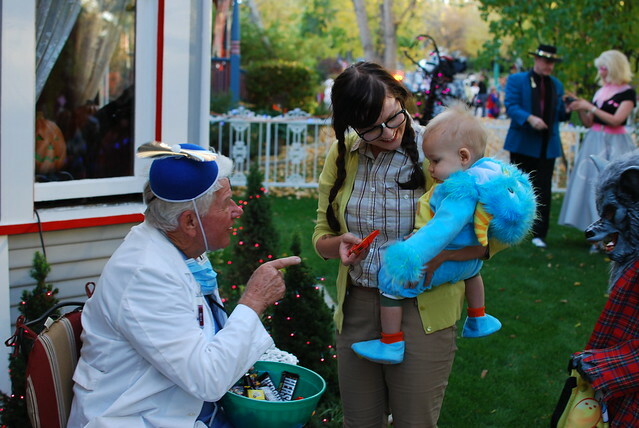 I love the Halloween photos and little Henry is so adorable! This comment makes me so sad! I'm sorry you feel like that. It's not my intention to ignore anyone, I respond to every single person on twitter, and I do my best to answer questions in the comments or email people directly. Some of my friends are what you'd call "popular" bloggers, and I read their blogs daily. Some of my friends are also not-so-"popular" bloggers, and I read their blogs daily too. The keyword here is friends. I'm busy. As you know I'm a Mom (who doesn't just sit around all day like you mentioned above), a wife, have a few different writing obligations. I comment on my friends blogs when I can, because it's how we keep in touch. These are people I have built relationships with over the years. There is no possible way I would be able to visit every single reader's blog and comment all of the time, as much as I'd love to. That's why I encourage people to email me. It's a bummer you feel so strongly about it that you had to leave a comment like this, saying I disgust you. However, you are entitled to your opinion. I just wish you wouldn't have been anonymous so I could have emailed you about this. I'd love to talk to you! 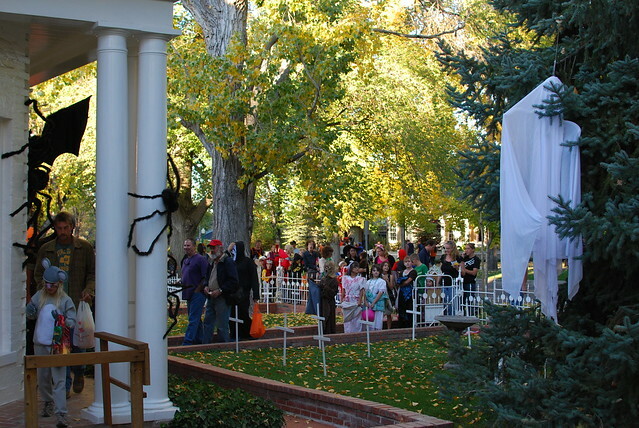 I always feel a teeny bit bad for kids who don't live in a small town on Halloween. Pictures of your town make me want to pack up my things and move there immediately. 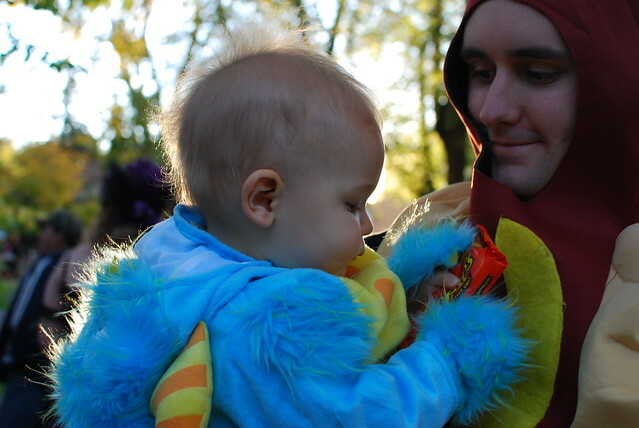 And your little monster could not be more adorable! Henry is just about the cutest little monster I've ever seen! Your neighborhood is so charming! This is adorable! I'm guessing this is Mt. Vernon street? 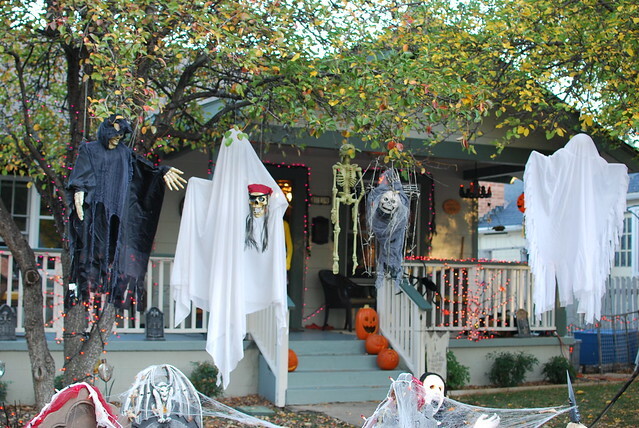 We went to a Halloween party on the street Saturday night and it was awesome but I was shocked by that house! The girl who lived there showed us the creepy basement below she refuses to even go into, a creepy tiny door so high up the wall it's almost on the ceiling, and a husband-wife headstone right there in the yard! You aren't popular until you get a hatefilled anonymous comment! YAY FOR YOU! 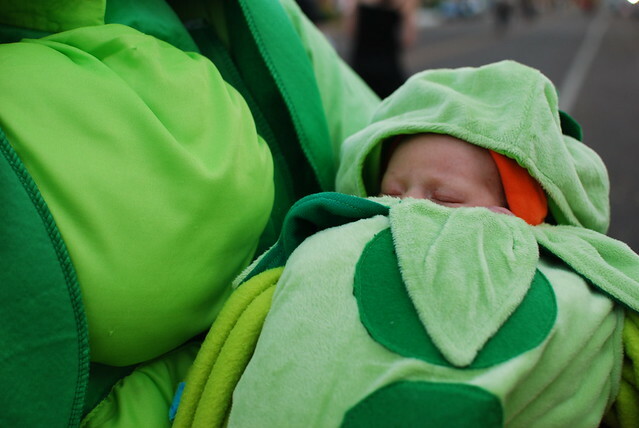 The peas are so freaking cute. You are living my suburban dream! 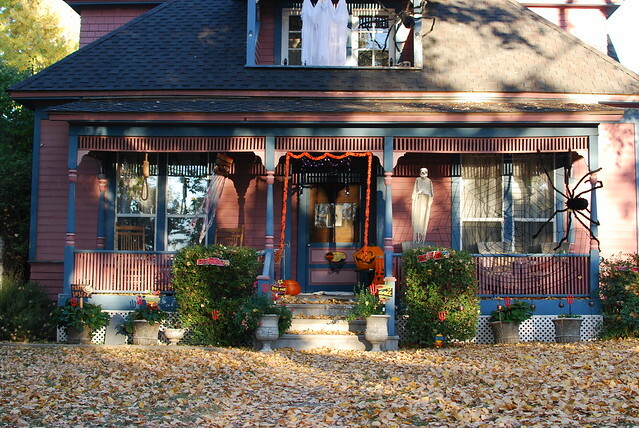 What a fun place to live with all that halloween festivity going on! WOW. Wow! 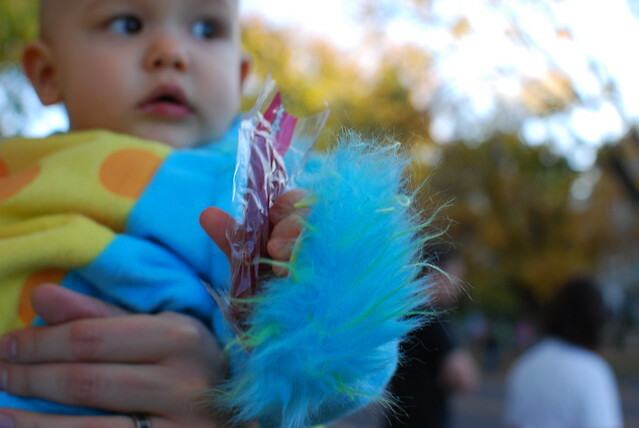 I can't believe how many kids are trick or treating in your pics!!! 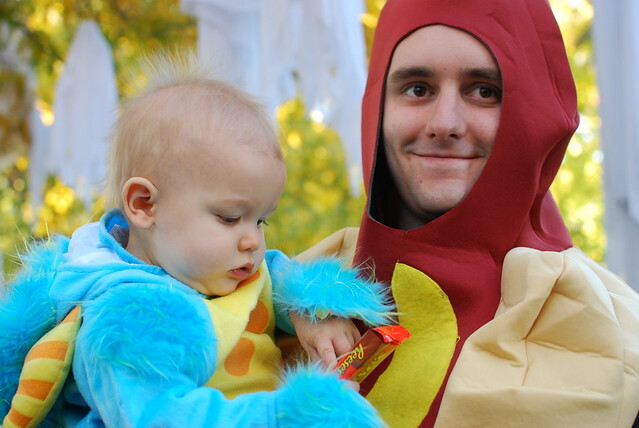 I also love the pic of hank & the other dad...so funny and adorable!! I love that your community was so into it! 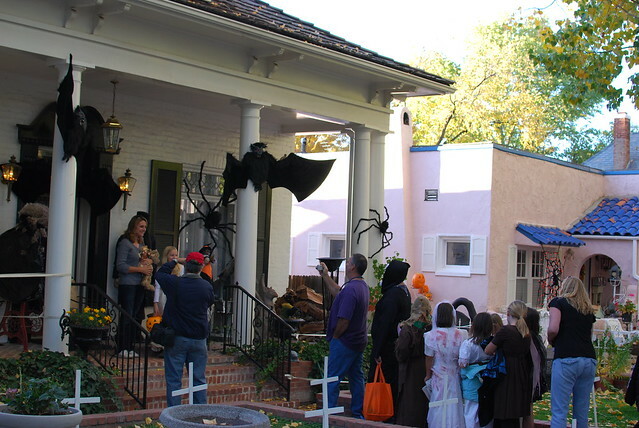 The house we helped hand out candy with only got about 20 kids...I just wish it was like when we were all little! I grew up there and trick or treated many times on that road! Love that the vegetarian chose to wear a hot dog! Your neighborhood is so picturesque. It looks like a sleepy midwest town, not what I'd imagine when I think AZ. I'd love to visit there someday - it's breathtaking! 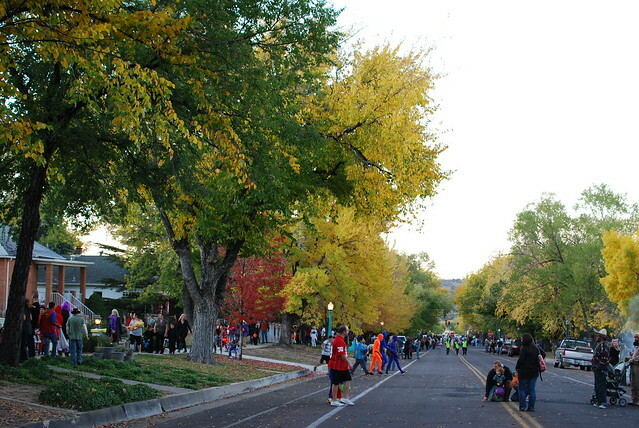 Looks like the perfect street for trick or treating, too. Your costumes are great! so awesome! 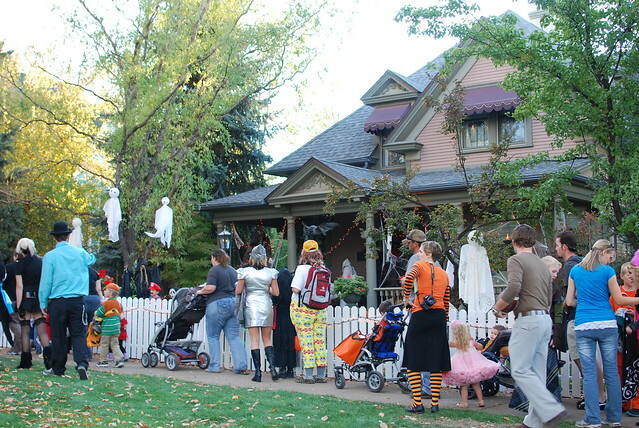 what a great neighborhood for trick or treating! 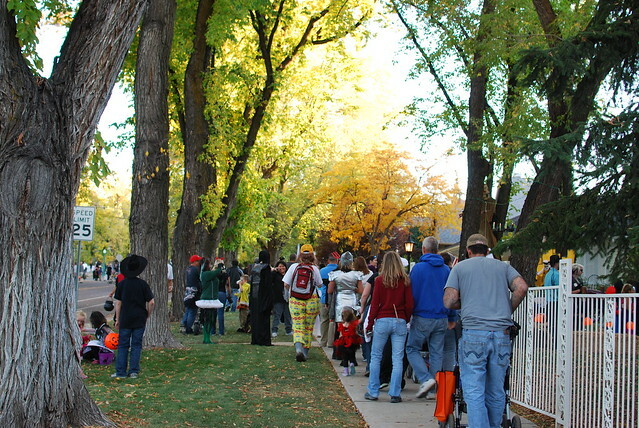 Wow, your neighborhood is HOPPIN' during Halloween! So cool! I wish it was like that where I live. I think I got 7 kids total. 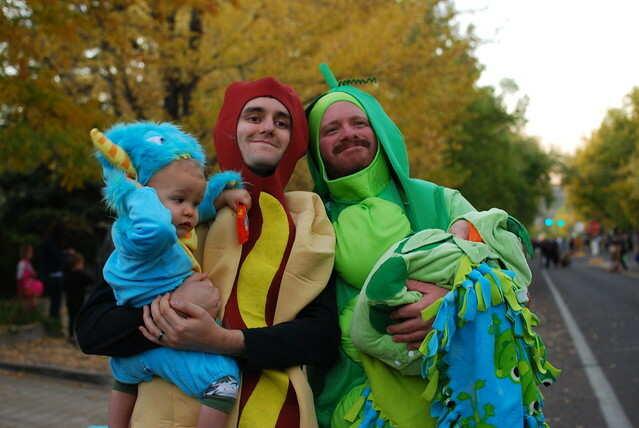 You guys look so cute and your husband's hot dog costume = hilariousness! Those houses are amazing! I love Henry's costume! I wish I lived in a lively neighborhood like this! 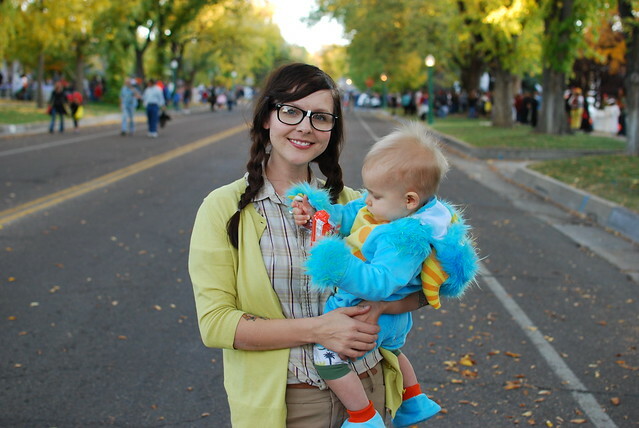 And your family halloween pictures are adorable. PS. the new layout is pretty much perfect. I seriously want to pack up the family and move to whatever small town you live in...this is fantastic! you guys look amazing! and can i say, there are beautiful houses in your neighborhood! Wow look at all those people! We didn't get one. :( I want to live in your town! This is lie my dream Halloween! I love seeing all those people out together! Holy Moly! 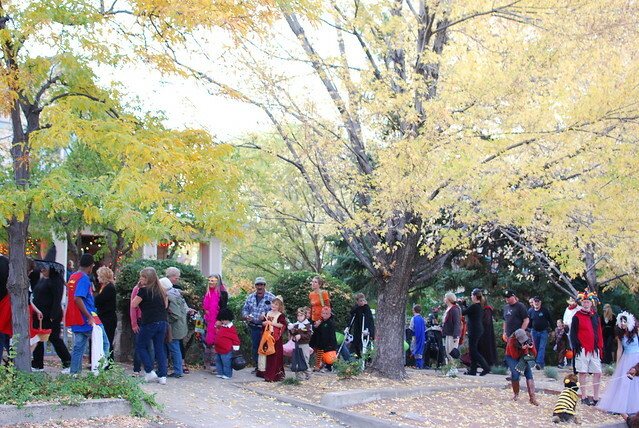 That's a lot of trick-or-treaters! Is anyone home to pass out candy in that town?? P.S. I am in LOVE with the new look of your blog! Seeing this makes me so happy. I love the little snippets of your life that you give in your blog, and this is just wonderful. Being Aussie, I've never seen "real" trick or treating like that. It's extraordinary to realise it really happens, not just in the movies. What a wonderful community event! Wow! This is great! 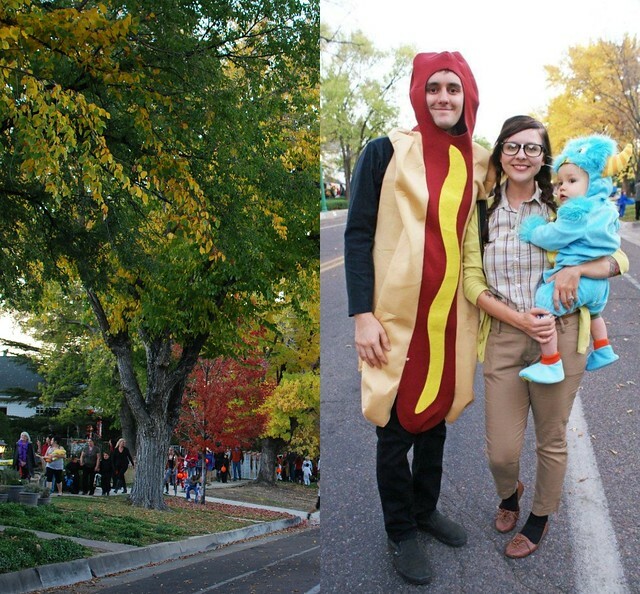 ;-) What a wonderful town halloween celebration! I love it! You guys look adorable! Wow! Look at that crowd! Henry looks adorable. Wow your neighborhood is so adorable! And what a crowed! Your costumes are super cute! This is awesome! It is so bright during trick or treating where you are. Makes me envious of the west coast. It was pitch black and cold with snow on the ground over here in NYC. Your nerd costume is very cute! Eeee, I love Henrys hair. Here in Germany Halloween is quite controversial. Some celebrate it and see it as another chance to celebrate as a family or with friends while others refuse to celebrate since its "just antother commercial bullsh.. from America". I loved your post and seeing you all having such a good time. Okay, the new blog design is AMAZEBALLS. And dude. These photos are PERFECTION!!! 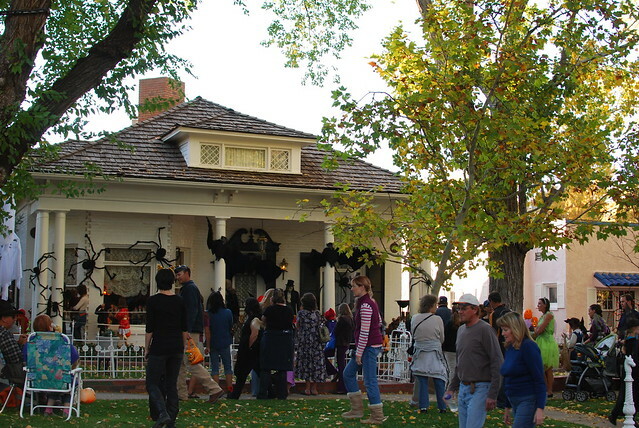 I want to come hang out with your little family in Prescott on Halloween next year!! What a fun and festive first Halloween. 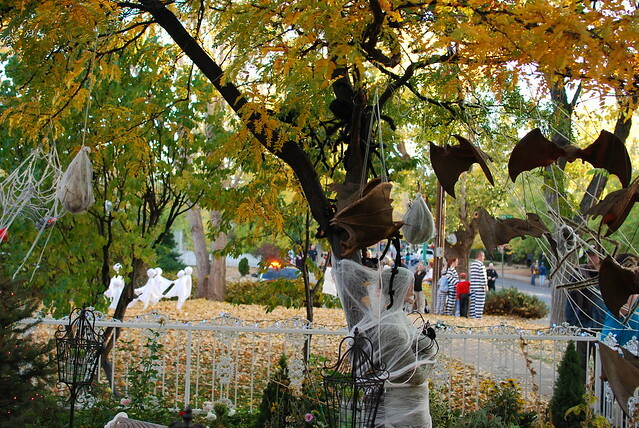 Great neighborhood, very spooky! Oh my Goood, this is awesome! This is how I always imagined American Halloween! Henry is a total cutie pie! You guys are the greatest. I love your little town. I can only hope that I have as awesome of a family as you do when it comes the time! Aww I love your outfits. Glad you had a good time. Your town looks adorable (and of course Henry does, too). 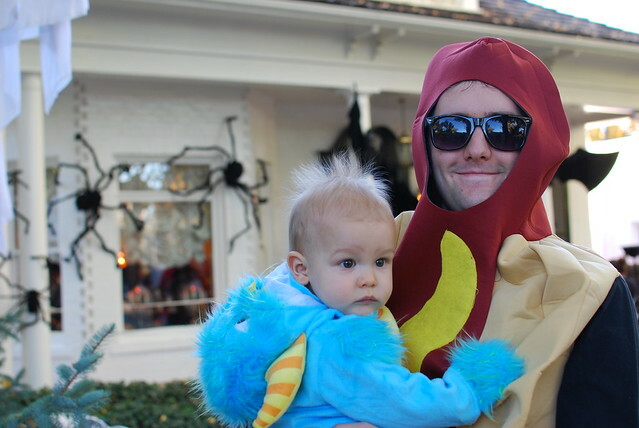 I think it's really fun that Hank dressed as a hotdog even though he's vegan. Glad you had such a wonderful day. 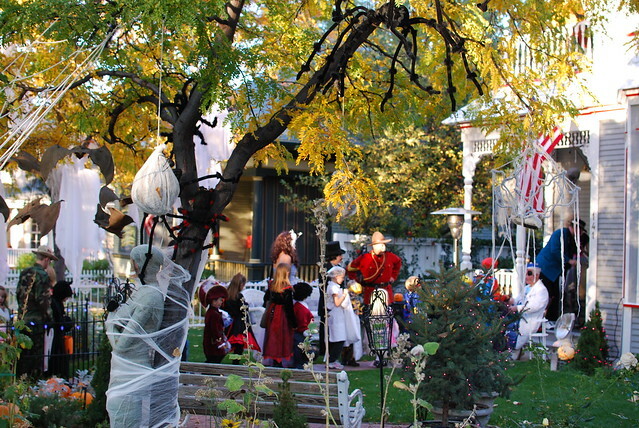 Your little town's Halloween looks fantastic...I'm jealous! Wow there's so many people! Your costume turned out great for being last minute. I love the photo where Henry's hair is sticking up. Too cute. Wow! Look at the crowds! That looks like so much fun! Halloween isn't really celebrated here in Australia, apart from the odd kid trick-or-treating and bars and pubs might do a Halloween themed night. 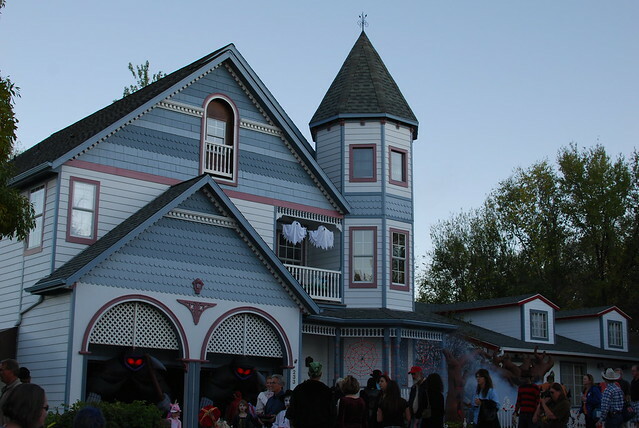 I want to visit America for Halloween! These are going to be so great for you to look back on as Henry gets older! Precious! Wow I wish we had that many kids in our neighborhood! What great pictures. Looks like you all had a blast this year! Celebrating with a little one sure makes EVERYTHING so much more fun! My boy had the same costume!!! Love it! Your town is BEAUTIFUL! I need to be in America for Hallowe'en. England does a crap job! Wow! That looks like the best spot for Halloween. Love all the photos. The hubs and I were just talking about how we don't put thought into dressing up for Halloween. We will be all sorts of dressed up next year! Oh man! You were such a cute little nerd. I loved all the pictures. Looks so very beautiful there! And all those houses?! So pretty. Also, your comment you left on my blog pretty much was the sweetest thing ever. Made my heart smile real big. I can't wait for the day I get to hug ya! I can't believe how many people there are! 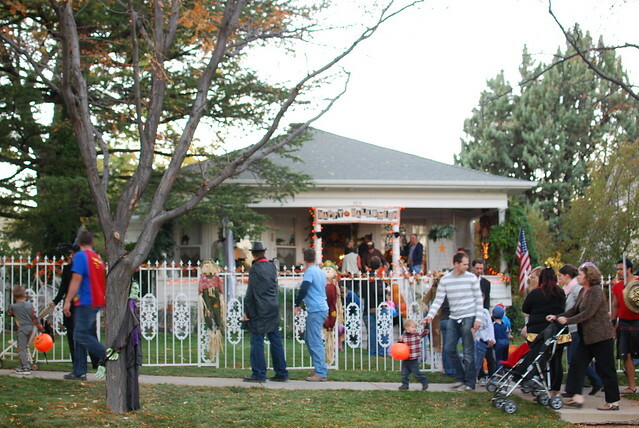 People in that neighborhood must spend a fortune on candy every year. 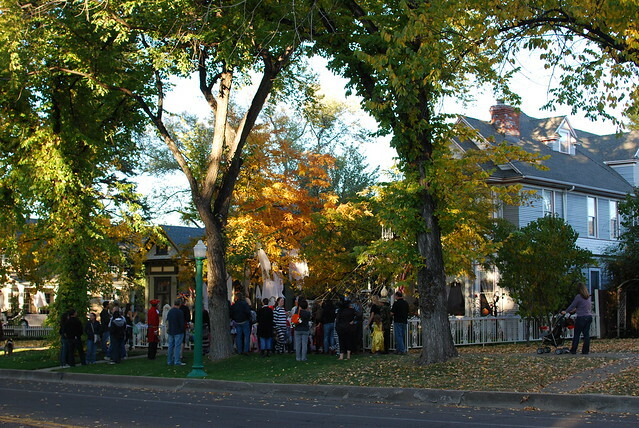 Even in the richest neighborhoods around here (where all the smart kids trick-or-treat) there are never that many people at one time. 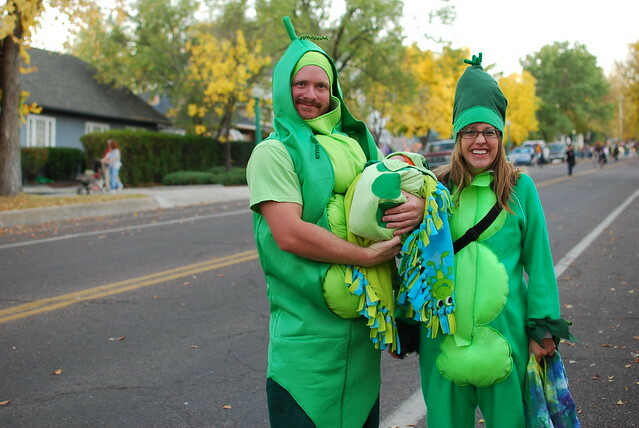 You guys look awesome, and your friends in the pea costumes with their little sweet pea baby are freaking adorable. What a cute costume idea. WOW!!! I love your city and all of the children trick r treating. How adorable. Love your blog! I love all the costumes! It looks so much fun, I never went trick-or-treating as a kid. Your town looks so charming; and those houses are so pretty! Oh my! Your town is so very beautiful! We still need to get up and visit Prescott. Might need some tips on great places to go ^_~ It looks like you have a blast on Halloween. HAHA that hot dog suit is EPIC. Made me laugh so hard. 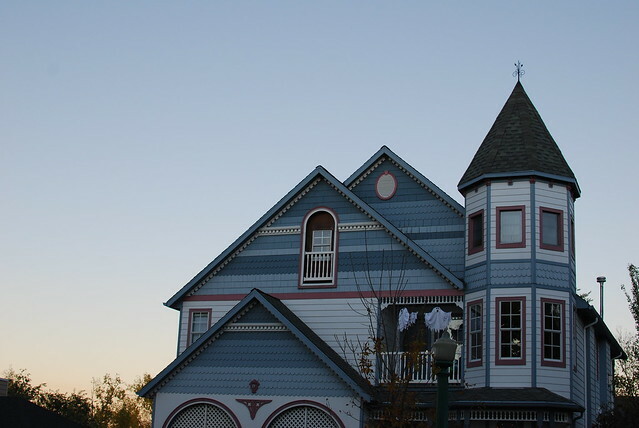 these houses are so adorable! where do you live?